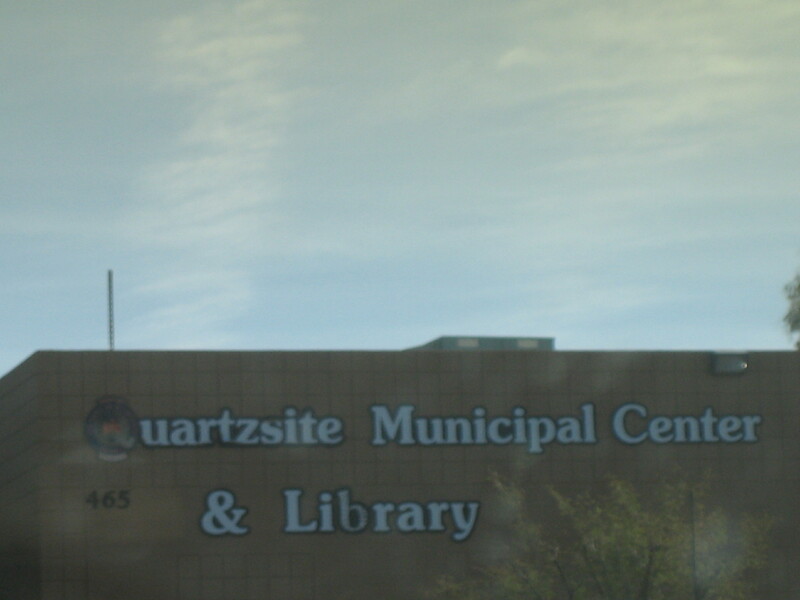 Quartzsite is a small Arizona town located at the crossroads of Interstate 10 and Highway 95. The town is 83 miles from Yuma; 125 miles from Phoenix; 296 miles from Tucson; 214 miles from Las Vegas, NV; and 17 miles from the California border. The town sits at an elevation of 813 feet, with the Kofa Mountains to the south. The population of Quartzsite (as of 2013) is 3,643, but that number swells in the winter, especially in January and February when the town is crowded with flea markets, rock shops, and scratch and dent groceries (over 1,000 vendors each year), most in temporary stores housed in tents. Of course, the shops wouldn’t exist without shoppers. The shoppers are primarily snowbirds who’ve come from colder climes to enjoy Quartzsite’s average temperature of 73 degrees (Fahrenheit). Most of the snowbirds are RVers (many in enormous motorhomes) who camp in one of the 60 RV parks in and around town or on Bureau of Land Management (BLM) land, in either Long Term Visitor areas or 14-day free camping areas. The shopping in Quartzsite is impressive. The United Nations of vendors sell out of temporary structures that are nothing more than tents, which make me imagine Middle Eastern bazaars and the marketplaces in villages of the European Middle Ages. If you want to buy shiny rocks, Quartzsite is the place to shop. If you want to buy an RV or accessories for the one you already have, Quartzsite is the place to shop. If you want great bargains on packaged food and don’t mind a dented can or a recently expired “sell by” date, Quartzsite is the place to shop. If you want to buy inexpensive tools, Quartzsite is the place to shop. If you believe one person’s junk is another person’s treasure, the Quartzsite is the place to shop. 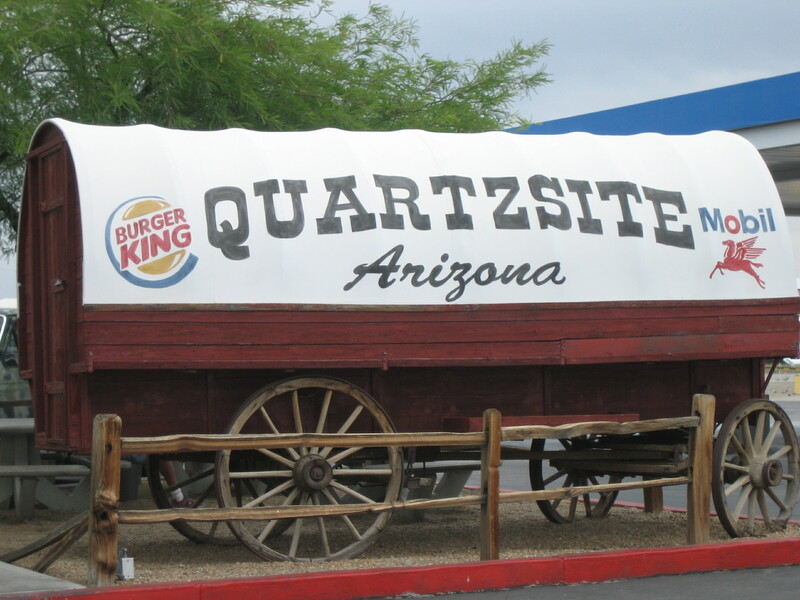 If you don’t know what you want, but sure enjoy looking, Quartzsite is the place to shop. If, on the other hand, you want to use free high speed internet, Quartzsite is really not the place to be. I don’t think the Quartzsite WiFi infrastructure is up to the number of people downloading, uploading, streaming, and trying to check weather and email. In 2015, I had luck using the free WiFi at Burger King, but the one day I sat there in 2016, I was in a constant flux of loosing my connection and logging back on. I couldn’t even get a post up on Facebook. One day I had luck at the Pilot, but the next day I couldn’t get my blog to load. I had better luck at the Carl’s Jr. one afternoon, but I wouldn’t say the WiFi was fast. It took me six hours to get two blog posts scheduled (even though both were already written and one was already a Word document I only had to cut and paste) because it took an eternity for each photo to upload. At least there was an electrical outlet to plug into. The WiFi at the Quartzsite public library was not any better than the WiFi at the fast food restaurants in town. The library consists of a couple of small, crowded rooms in the Municipal Center at 465 Plymouth Road. The library is crammed with books, and nonresidents can even borrow them. The library also houses several public access computers which seem to always be in use. I tried utilizing the library’s free WiFi on my laptop, and the service was super slow and frustrating. Don’t expect to charge electronics in the library. When I asked a library worker about electrical outlets, she said there were none. When my friend found one hidden behind the books and plugged in his phone, he was chastised by a worker for using the library’s electricity. For folks looking for shopping that doesn’t involve flea markets and shiny rocks, there are several thrift stores in Quartzsite. (I’ll post some info about Quartzsite thrift stores soon.) For book lovers, Reader’s Oasis Books is not to be missed. For folks who are all shopped out, there are some other cool things to see in or near Quartzsite. 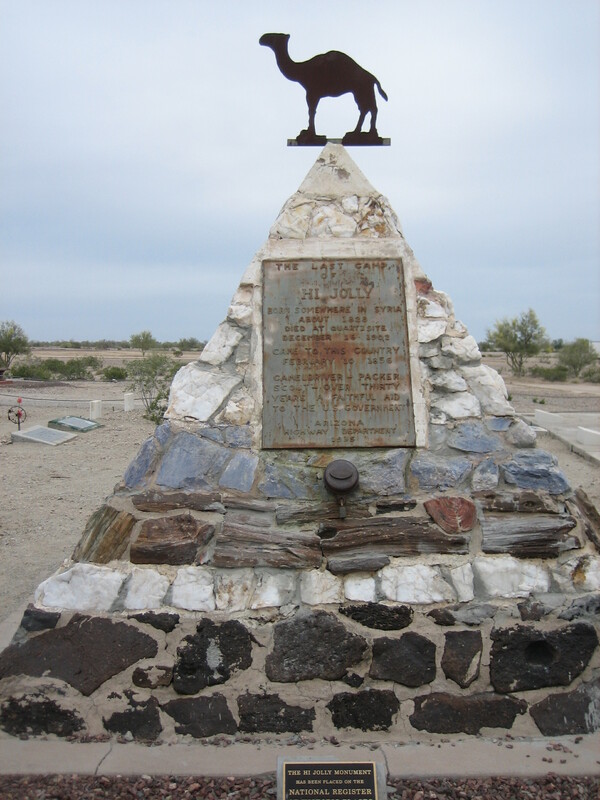 Said to be the most visited location in Quartzsite, the Hi Jolly Pioneer Cemetery is an interesting place to visit, especially for history buffs. In 2015 I visited the Tyson Well Stage Station Museum. Admission was free, so it was worth the visit, but I can’t say I was impressed by the exhibits. I thought there was too much stuff crammed into too small a space. Many pieces were on display with no explanation as to why they were there. Of course, the museum could have changed for the better in a year, so I urge history buffs to check out the museum at 161 West Main Street. Other places I haven’t visited by look interesting include the Great Tree, a 1,050 year old ironwood tree that’s witnessed the entire 100+ years of Arizona statehood; Celia’s Rainbow Gardens, located at the north end of the Quartzsite town Park on Plymouth Road; and the Quartzsite Rock Alignment and the Bouse Fisherman, a 30-foot-long intaglio. Thanks to the 2015-2016 Quartzsite Vistor Guide (www.quartzsitevisitorguide.com) published by Pilot Rock Publishing for many of the facts in this post. 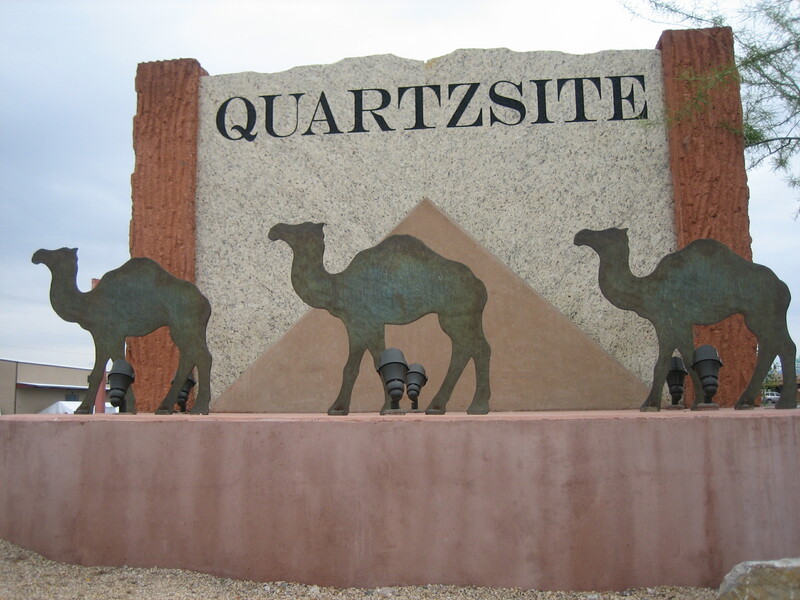 Do you happen to know why the Quartzsite signs feature camels? Just curious. you will learn about the U.S. Army’s camel corps and the connection to Quartzsite. Blaize, I’m so glad to have found your blog (thru the gorge bridge vendors FB page). I like your writing style and look forward to reading your posts every morning. Your recent posts about Quarzsite re-enforce my desire to make it out that way during the month of Jan. I would love to meet you and share a meal at a campfire. Thanks for your positive feedback, Andrea. I am glad you enjoy my writing and want to read my posts every day! Yes, we should definitely meet up in Quartzsite if we are ever both there at the same time.